This is the ordering website for Cedar Run Farm. Cedar Run Farm is a family owned business run by Marilyn and Lew Dodd. The Dodd family can trace its farming roots in Queen Anne's County back to the Revolutionary War times. Our current farm in Sudlersville was purchased in 1951 and our family moved in January 1, 1952, when Lew was 11 months old. We've been here ever since, providing healthy food for our family and our community, while preserving the natural beauty of the land. We farm on 92 acres, plus we cut hay from other nearby rented farms. Our Animals: We raise our own beef cattle and sell USDA inspected, naturally fed, dry aged beef to retail customers, neighbors and friends. Our beeves are raised in fresh air, on native pasture, with salt, minerals and fresh water. They are also finished on pasture (grass fed & finished) to give our beef a rich flavor, plus health benefits that can't be found in feedlot, supermarket meat. We do not use growth hormones, growth stimulants, artificial or antibiotic feed additives. 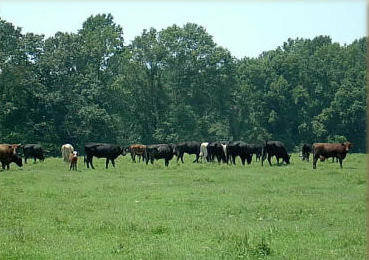 Our cattle eat grass, as nature intended, and live a great life. We also raise hogs, meat chickens and egg layers, and turkeys. Please click the Additional Information link to learn more about our natural and environmentally friendly farming practices. NOTE: See our special on Bar-B-Que pigs in our Bulk Order section to the left! You can order from our inventory at any time if you want to come to the farm to pickup your order. Just place your order and we'll contact you to arrange a pickup time. Generally speaking, we're available Monday through Friday 8AM to 6PM and Saturday 8AM to 5 PM. We do offer free local delivery for orders of $250 or more. If you live or work in Annapolis, Stevensville, Cambridge, Centreville or Easton and want us to deliver your order, you must order when the "ordering window" is open for your neighborhood. You can see the ordering and delivery schedule by clicking the Delivery Options link above. NOTE: Please click to the Additional Information/Ordering Details page to learn about how our Neighborhood Delivery system works. Note that many products are priced by weight, so the exact pricing will not be known until we select the actual items that will fulfill your order. We are not a factory who cuts to order. However, the shopping cart will show the approximate total cost for each item. When the order is placed, you will receive an immediate confirmation email with a copy of your order, including the approximate pricing. When your order is completed you will receive an email with the exact cost of your order.